APS Board of Education meeting today – are you ready for a property tax increase? The Atlanta Public School Board of Education will meet today at 2 p.m. and will consider a number of FY16 Budget alternatives. One of the alternatives includes a one point increase in the millage rate that would raise an additional $18 million for use by the District. 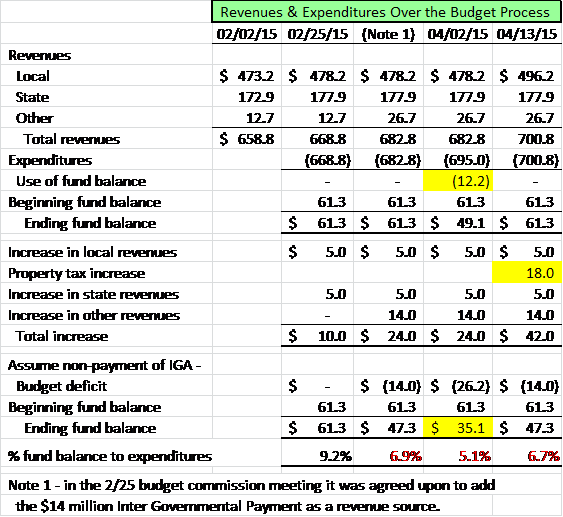 The following chart shows the progression of budgeted revenues and expenditures since the first meeting of the Budget Commission on February 2. Up until after the February 25th meeting all appeared to be moving forward cautiously and in a fiscally conservative manner. While there were many unfunded priorities (adding teachers in areas with large class sizes was not one of them), the self-imposed policy of maintaining a fund balance at 7.5% of expenditures seemed to restrain both the Administration and the Board from adding expenditures without a revenue source to cover them. As background, in the February 25th meeting, the Budget Commission agreed to put the $14 million BeltLine (IGA) payment into the budget as a resource. However, it prudently recognized that the payment was in doubt due to the dispute between the City of Atlanta and APS and indicated that it would maintain its excess General Fund reserve (amount over 7.5% of expenditures) as a back up in case the BeltLine funds were not received. This action left the proposed budget balanced and, in the event the payment was not received from the Beltline, the General Fund reserve policy would be adhered to. But then something changed – the Administration continued to push to recognize additional funding resources and the budget began to shift to a precarious position. At the April 2 meeting, the Administration proposed that in addition to including the BeltLine funds (which remain in doubt), the General Fund reserve of $12.2 million would also be used. Revenues would stay the same at $682.8 million, but expenditures would be increased to $695.0 million leaving a deficit of $12.2 million. The proposal pushed the General Fund reserve down to 7.1% of expenditures and below the Board imposed target of 7.5%. It is also important to note that if the BeltLine payment is not received (and there is no indication that the City’s position on this has changed) the General Fund reserve would go down to $35.1 million or 5.1% of expenditures. In either case, it is likely that APS will have to borrow short-term money to cover operations during the first part of the fiscal year. And today we are seeing a new proposal which would increase property taxes by one millage point or $18 million. With the additional property tax funds, the total revenue would increase to $700.8 million or nearly $14 thousand per student. Just last year it was closer to $13 thousand per student. In total, the increase over FY15 would be $42.8 million or 6.5%. Over two years, the increase is over $105 million. Under the new proposal, the increased tax revenue would result in no General Fund balance being used in FY16 if – and only if – the $14 million in BeltLine funds are received. If not, then $14 million in General Fund reserves will have to be used and bring the reserve down to 6.7% of expenditures – which again is below the Board policy level. Do you support a tax increase? Some Board members have already indicated that they do. If you disagree with the tax increase, it is important that you let the Board members know now. If you disagree with spending the General Fund reserve down to levels below the prudent and fiscally conservative policy previously established by the Board, you should let them know that as well. This entry was posted on Monday, April 13th, 2015 at 11:55 AM and is filed under APS Board Meetings, APS Budget. You can follow any responses to this entry through the RSS 2.0 feed. You can leave a response, or trackback from your own site. 2 Responses to APS Board of Education meeting today – are you ready for a property tax increase? Hey Bob – What are the big ticket items bought with the additional $32M spending (700.8 vs. 668.8)? Is it easy to say what makes it up or is it a lot of little stuff? Thanks!